The exclusive Let Teddy Win! T-Shirt in a wide range of styles and colors, plus Presidents Race campaign shirts, #26 jerseys and more. 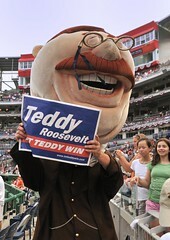 Support Teddy Roosevelt to win the presidents race with buttons, stickers, and presidents race campaign signs. Perfect for a night game at Nationals Park, Let Teddy Win! sweatshirts and hoodies come in mens, womens, and junior sizes. Exclusive Let Teddy Win long sleeve t-shirts and jerseys in styles and colors for men, women, and kids. Infant, Toddler, and Kids Sizes! A selection of Let Teddy Win items in sizes and colors designed exclusively for the littlest presidents race fans. Great gifts for Washington Nationals fans of all sizes -- from caps to mugs, pet products, undergarments and more.